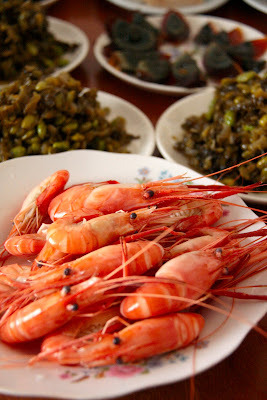 Lunch at the peach farm was a huge home-cooked spread of eighteen different dishes. All this had come out of a very traditional farmhouse kitchen about half the size of a conventional western kitchen, and in all, there were about thirty-six of us Shanghai city folk to be fed. So while everyone was sampling the peaches, I was nosing about in the kitchen and chatting to the farmer's wife about lunch, and watching the cooking in progress. The kitchen was dominated by a very old wood-fired stove, decorated all over with tiles and simple frescoes. 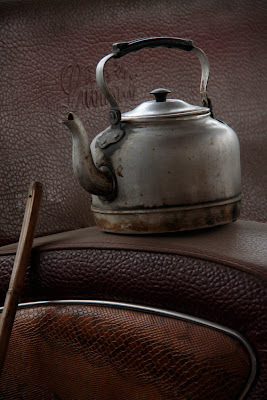 These old fire stoves are almost extinct, in fact the first time I ever saw one was in a museum in Shanghai, but they are still used in larger country houses where there is plenty of space, and plenty of firewood. They are usually very simply decorated, if at all, but this was by far the most colourful one I'd seen. The fire is at the back, and it fuels the three set-in woks at the front, two large and one small. They can be used for stir-frying, or filled with water and used as steamer bases. The largest wok here, on the left, was filled with water and covered with a giant two-tier silver steamer. 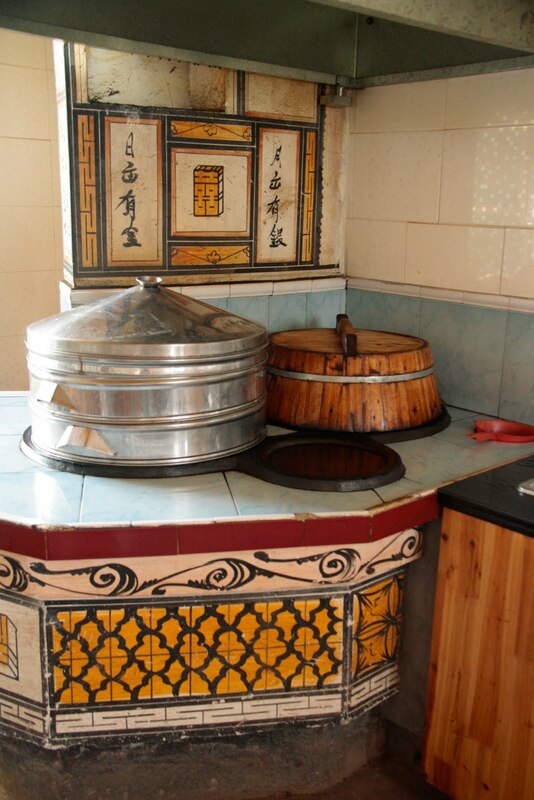 The wooden tub sitting on the other side was slow-cooking a type of fragrant rice pilaf. The smallest wok, in front, was filled with water ready to blanch the soy beans that a girl was shelling on a stool outside the kitchen. 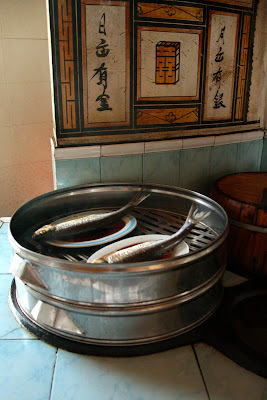 The steamer lid was removed to reveal four whole fish in two tiers, being steamed whole with soy, ginger and garlic. The easiest way to cook fish, ever. A little splash of sesame oil at the end and you're done. Cooked this way, the fish retains its shape and skin, and is always very tender. 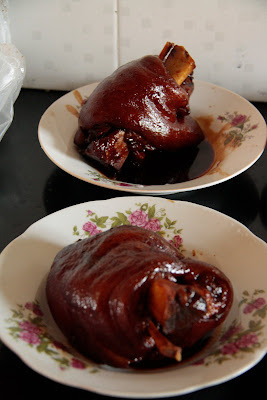 The kitchen bench held the dishes already cooked - slow-braised pork knuckle in red sauce. You can cut it with a chopstick. Alongside were plates of eggplant with garlic and soy, vinegar beans, and poached chicken. The cold dishes were ready to serve from the small table in the next room. Fresh whole prawns, thousand-year old eggs, and dishes of salted and pickled farm greens. The stand-out dish though, was served last along with wintermelon soup, to aid our digestion and ward off too much internal heat. 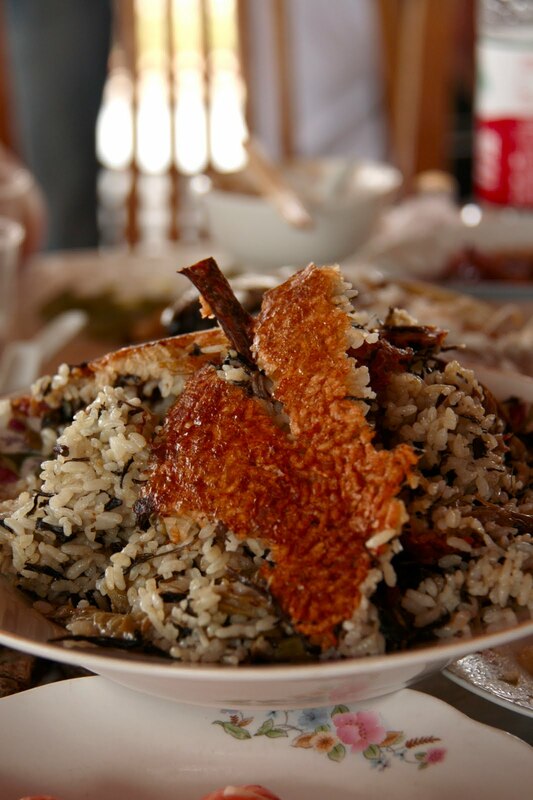 Rice dishes are often served at the end of a meal, to fill up any emptiness that might still exist after the first sixteen dishes. This one was a winner - it was long-grain rice, slowly cooked in the wooden tub on the wood-fired stove with slivers of pork and the same salted pickled farm greens mixed in. 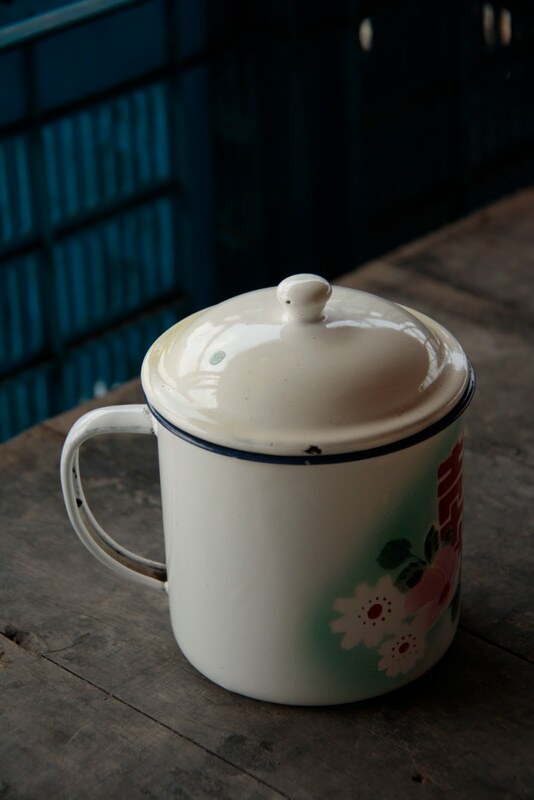 The base of the wooden tub was cast iron, so the bottom layer of rice had turned nicely crispy. The crunchy base was served broken up on top of the dish. It was reminiscent of the persian dish cooked in the same way, but without the addition of spices and dried barberries. Anyway, I ate way more than was good for me, or I had room for, because it just tasted so good. Afterwards I had to have a digestion-aiding cup of green tea, and a sleep in the car all the way home.